Whilst the list could be endless, it primarily includes the vast range of Rhine stoneware from the resilient Westerwald salt-glazed flagons, to the creamier Freiberg and Sieberg bodies and also the charming Bellarmine jugs that were popular imports. 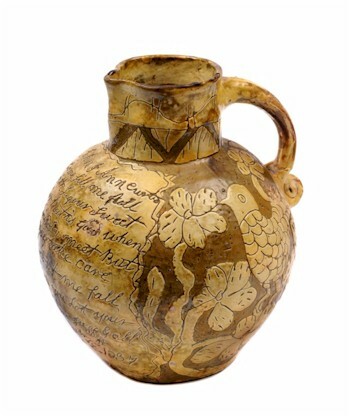 A salt-glazed Bellarmine jug (FS1/24). 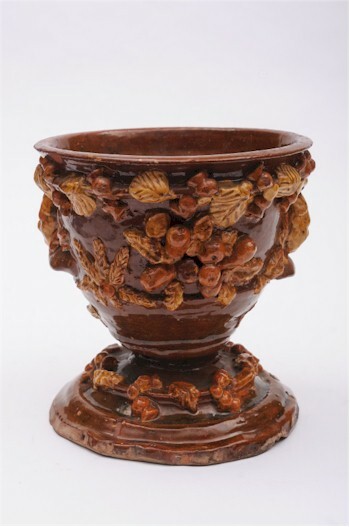 The Bellarmine stippled, brown-glaze was eventually copied by domestic potters The the more finely potted English salt glazed-teapots, caddies and other tea wares, mugs, bowls show that good stoneware could be a genuine competitor to porcelain. The latter, more often than not made in Staffordshire, though some very attractive pieces were made locally at Bovey Tracey. 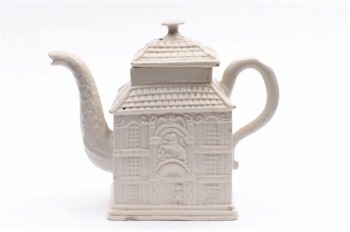 A Stafford salt-glazed teapot (FS9/553). Also on the domestic front and predominantly, though not exclusively, Staffordshire, are slip wares – a pottery body enhanced with the decorative addition of contrasting liquid clays that could be applied in a profuse and meticulous way similar to the work of the late 17th century potter Thomas Toft, or a little more naively like his close contemporaries at Wrotham or more uniformly in the striking linear or combed designs most commonly found on baking dishes. 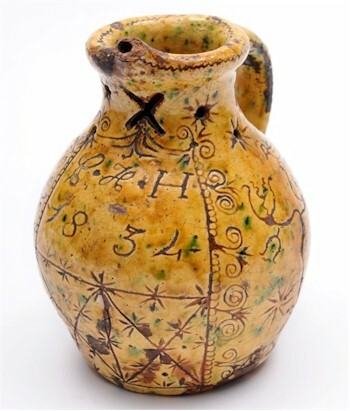 A North Devon pottery jug (FS5/17). However, being West Country based, the most significant group must be the home grown, North Devon pottery, made from the local red clays and decorated with white china clay slip from Peters Marland. Sometimes applied with trailed slip designs, but more traditionally with profuse sgraffito decoration of sailing vessels, flora and fauna that reflects it's rural and coastal location. Amongst this group, it is the harvest jugs with their bellied form and handle terminating in a typical tight scroll that are the most desirable, often used as presentation pieces for births, birthdays and marriages. The best examples are adorned with names, dates, places and poetic texts. Although rustic and rural in their appeal many were exported to America through the ports of Bideford and Barnstaple. 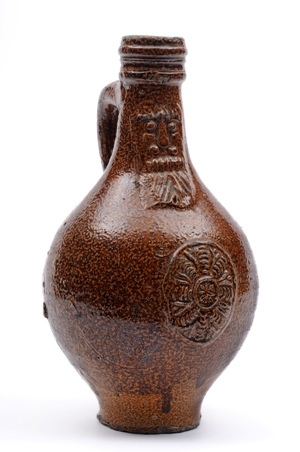 A Donyatt pottery puzzle jug (FS7/20). Two similar groups of local pottery worthy of mention is that centred around Donyatt in Somerset which is often quite similar in design and decoration to North Devon wares. Unsurprising, as the first potter in Donyatt, John Jewell hailed from Bideford. A Fishley (Fremington) pottery bowl (FS16/416). And finally, a mention for the Fishley family from Fremington – midway between Barnstaple and Bideford, thoroughly steeped in the North Devon tradition and providing a bridge between the traditional artisan potters and the so called art and studio potters of the late 19th and early 20th century.